Step Clean the fish, pat dry with kitchen paper. Insert a few pieces of ginger into the fish. Tata bgn scallion white plate and a few pieces of ginger is sliced ​​thick. 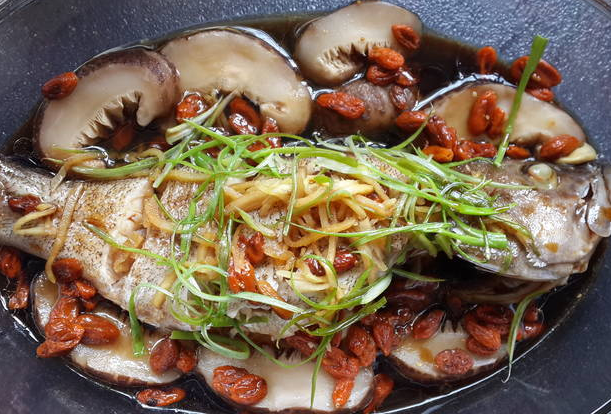 Boil water After boiling, place the fish on a plate and arranged with the rest of tebal..tabur gojiberries sliced ​​ginger and shiitake mushrooms governance. Steam for about 10min until cooked. Set aside the broth of fish or fish lift and transfer to a serving plate. Taste the broth, if putrid or bitter to be thrown away. if not fishy and bitter, save 1 tbsp. mix sauce ingredients: soy sauce, brown sugar, chicken broth and fish broth. Bring to a boil and cook briefly until slightly reduced slightly. Tata ginger and scallions thinly sliced ​​green part above the fish ..
Heat the oil. then flush (2-3 tablespoons) over the fish. Followed by pouring the sauce. - for oil I use a mixture of canola and sesame oil minyam. - I wear brand fish sauce Tai Hua specifically for steamed fish. 0 Komentar Untuk "Stim grouper ala Hong Kong"